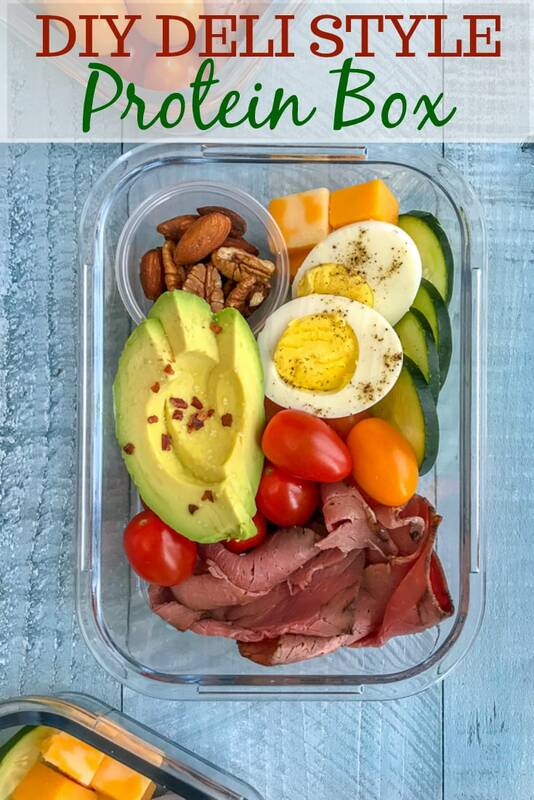 Protein-packed boxes like this DIY Deli Style Protein Box idea are the way to go! 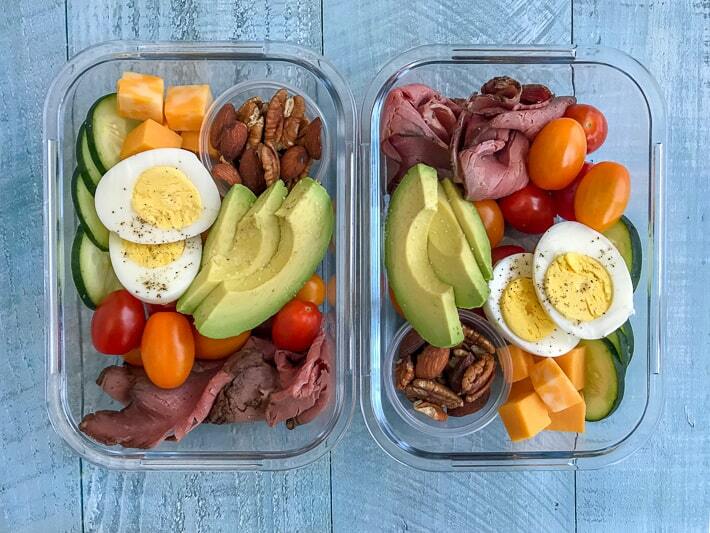 They come together in under 15 minutes, are high in protein, low in carbs, and keto-approved. Perfect for busy, healthy lifestyles that need something quick and easy to grab as you’re running out the door! The best part of this meal prep protein box is that it requires zero cooking! All it takes is a little of your time putting together and tossing into the refrigerator. 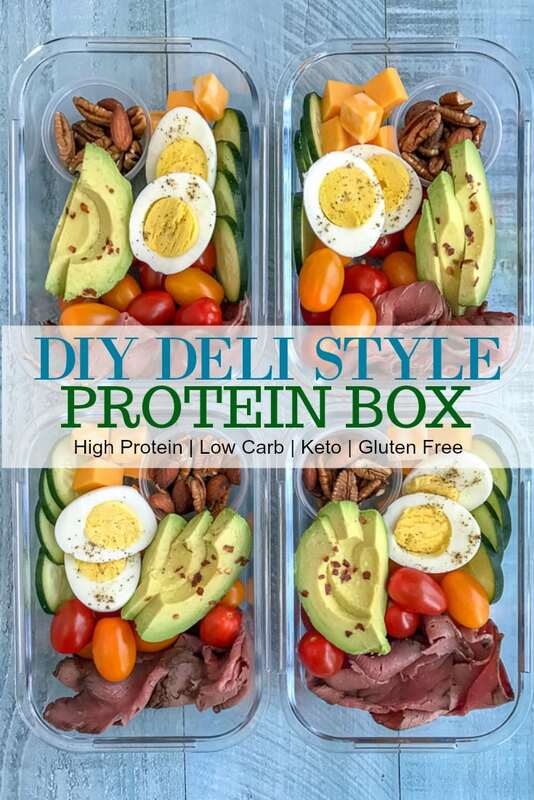 These DIY Deli Style Protein Boxes make for the best and easiest high-protein, low-carb make ahead breakfast, lunch or post-workout snack option. 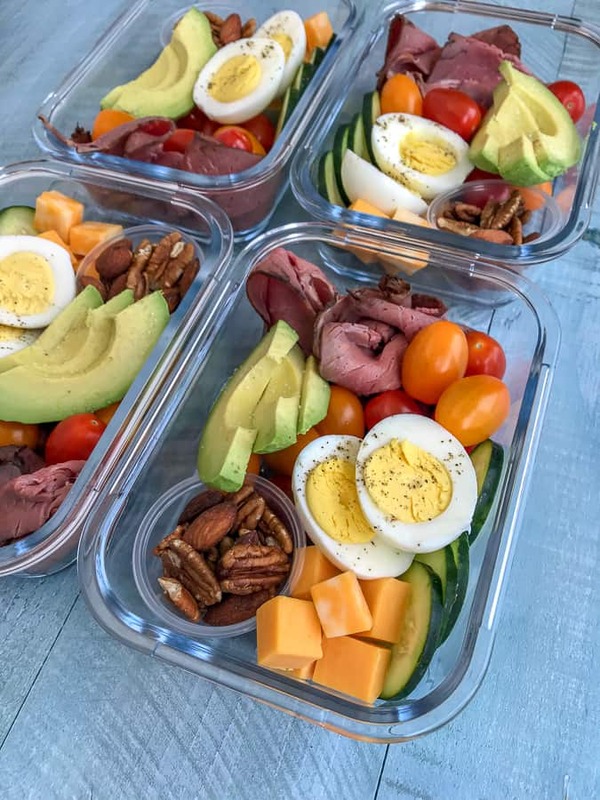 Meal prepping is an excellent way to have healthy meals at your fingertips, so that you can stay on track with your goals. I know that if I have something pre-made, I am more likely to stay on track, choosing and eating something healthy over something convenient. I’m a food blogger, so I’m not afraid to take the time to cook a meal. But when I’m tired and/or very busy with work? I just want and need something I can quickly grab and eat without much thought or time invested. 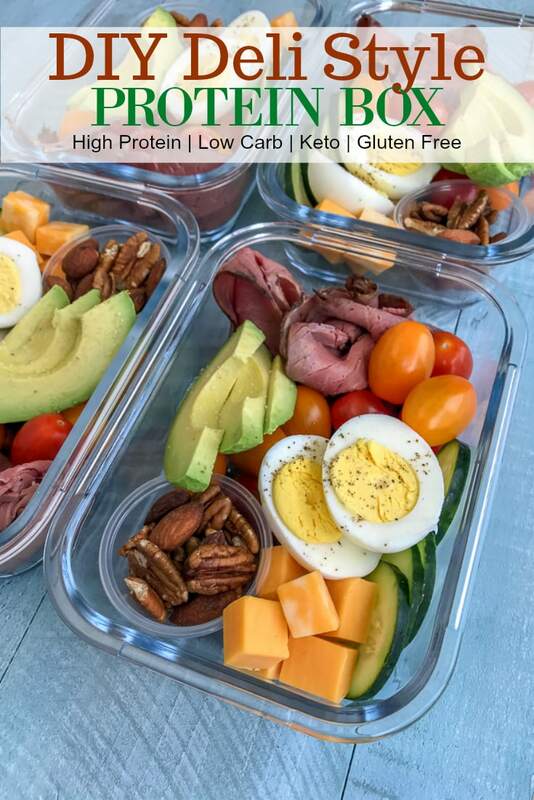 That is what is so perfect about meal prepping boxes like this! 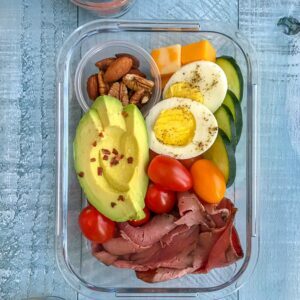 Four Glass Meal Prep Containers – these work splendidly! If you prefer divided compartments, I have these 3 Compartment Glass Meal Prep Containers and they are very nice. Four 2 Ounce Disposable Plastic Cups – for the nuts, hummus, nut butter, etc. Or I also love to use Reusable Salad Dressing Containers. Hard Boiled Eggs – you can make your own very easily and quickly or buy the pre-packaged ones. Making your own is SO much cheaper! The great thing about these protein boxes is that you can add as little or as much of an item as you prefer. If you’re not a fan of roast beef, swap it with chicken, turkey, salami, pepperoni, etc. Not a fan of walnuts or almonds? Swap those out, too, with the nuts you prefer. The options are endless. Add in hummus to dip your vegetables or cheese in! Unless you’re pressed for time, I do recommend making your hard boiled eggs! Using my method, you can have the eggs ready in the Instant Pot very easily in 15 minutes. Start those first and let them boil while you prep the containers! They will be done when you are. All you do is set it and walk away. The pot does ALL the work. Which, in the long run, also saves you money! I remember my husband bulging his eyes watching me grab pre-packaged hard boiled eggs once. I wanted them for a salad and I was too lazy and busy to make my own. Which is exactly what he questioned – why I didn’t buy a dozen eggs (which are much cheaper than a pack of 4 hard boiled eggs!!) and make my own. So now I do! With my Instant Pot! This recipe makes 4 protein boxes that can be stored in an airtight container in the refrigerator for 4 days minimum and 7 days maximum. I recommend keeping the eggs whole, rather than slicing them. They are sliced merely for photos. They dry out slightly when sliced and sitting. Avocado: Aim for an avocado that is still on the harder side. NOT rock hard mind you. Check under the stem for ripeness. If it is green underneath the stem, then the avocado is perfect. If it’s more of a brown, then its overly ripe and I do not recommend slicing and prepping. You can slice an avocado (with a green stem) the night before or the morning of. To keep it from turning, squeeze lemon or lime juice over the top. I also find adding a touch of sea salt helps, as well. 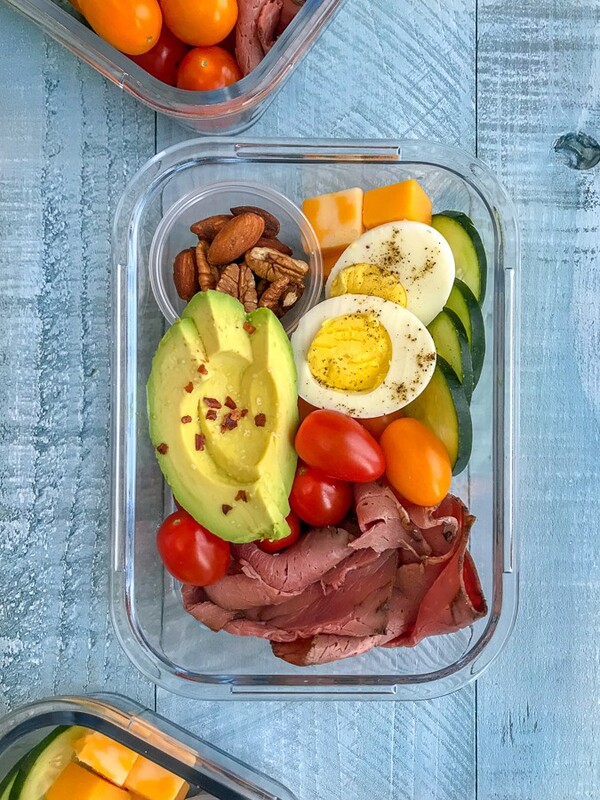 An easy, low-carb and high-protein meal prep option that is perfect as a healthy lunch, snack or post-workout snack. Comes together in no time and is fully customizable. Divide the walnuts and almonds between four 2 ounce plastic cups. Place into containers. 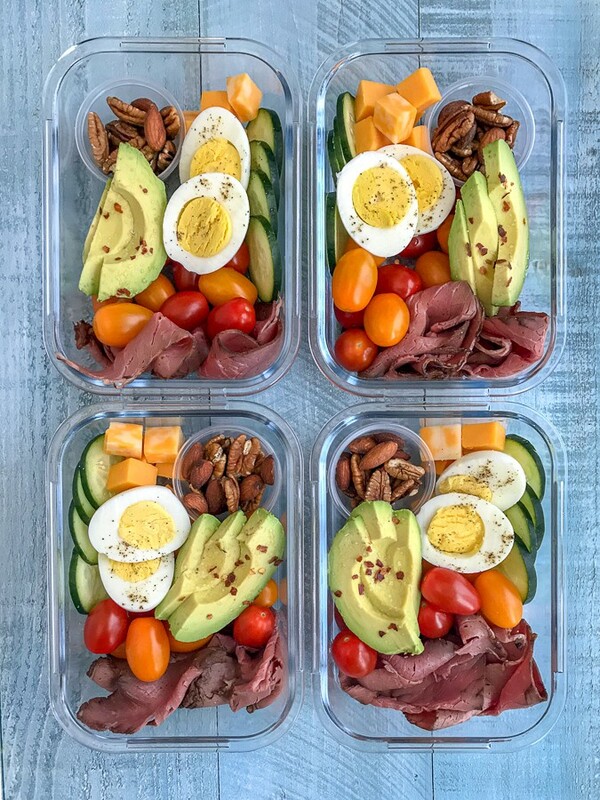 Divide the remaining ingredients listed: eggs, cucumber, roast beef, cheeses, cherry tomatoes, and avocado between four Glass Meal Prep Containers. Place the lid on each container and store in the refrigerator until ready to eat. Can be stored for 5-7 days. Avocado: Aim for an avocado that is still on the harder side. NOT rock hard, mind you. Check under the stem for ripeness. If it is green underneath the stem, then the avocado is perfect. If it's more of a brown, then its overly ripe and I do not recommend slicing and prepping. You can slice an avocado (with a green stem) the night before or the morning of. To keep it from turning, squeeze lemon or lime juice over the top. I also find adding a touch of sea salt helps, as well.